I took the airplane out this afternoon for some overdue exercise. The skies were clear, the sun warm, and the ramp outside the hangar finally clear of the treacherous ice that coated it throughout January. I flew to Wellsboro-Johnston airport (N38) just beyond the Pennsylvania state line for fuel. 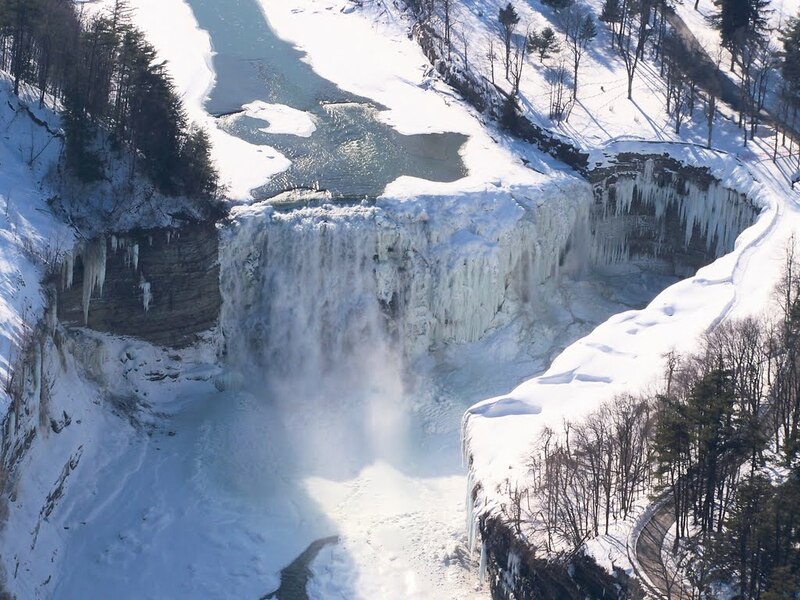 Along the way, I circled the waterfalls in Letchworth State Park. I'm fond of the above shot of the gorge wall. Note the two small cabins in the foreground that present a sense of scale. 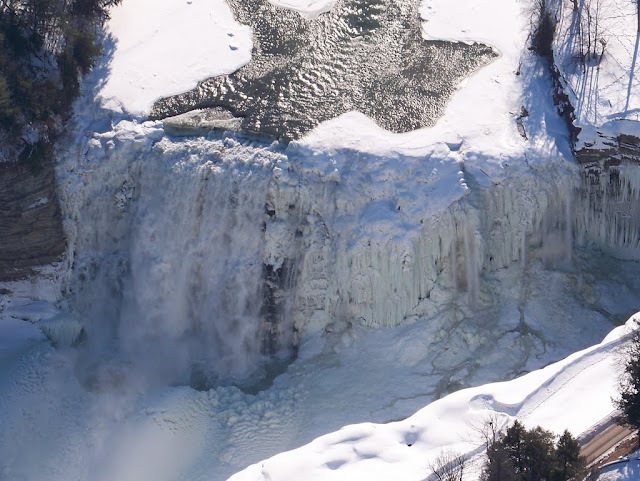 I have visited Letchworth twice already this year, but today was unique. 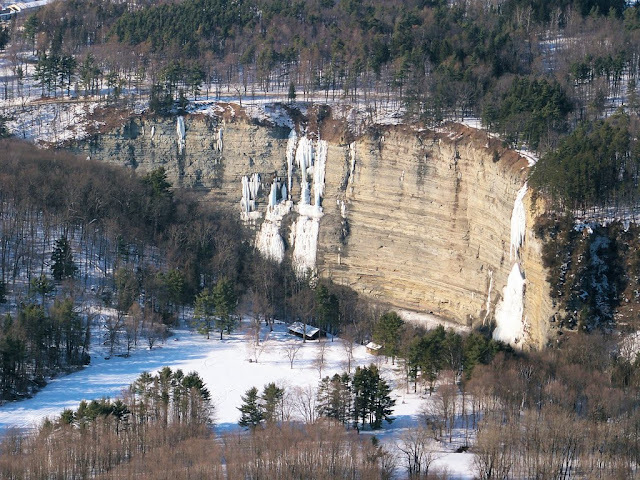 Unlike previous visits, the 107 foot high Middle Falls were mostly frozen. A close-up of the frozen waterfall. Pretty...but just looking at this frigid spectacle inspired me to increase the amount of heat being pumped into the cabin. Brrrr! I landed in the perpetually squirrelly winds at Wellsboro-Johnston after trying to communicate with a departing Archer that was broadcasting on the Unicom frequency, but not actually listening to it. As always, proprietor Wes met me at the fuel pump with his four-legged assistant managers, Pratt and Whitney. Did I need to fly so far away for cheap fuel? No, but I always enjoy landing at Wellsboro and I just wanted to fly somewhere after staying close to Rochester since last October. On the way home, I landed at Dansville to have a "coffee" with Dan (I don't drink coffee, so I had a Coke instead). We chatted until realizing that the sun had dropped below the surrounding hills. Warrior and RV departed Dansville and encountered Matt in his Lancair orbiting Le Roy. We landed as the sun set, a massive red fireball on the horizon that enflamed the heavens. Clear skies, airplanes flying, and pilot camaraderie...foreshadowing of better weather ahead. Surely, a more concrete indicator of winter's end than the behavioral quirks of an overgrown Pennsylvania rodent.